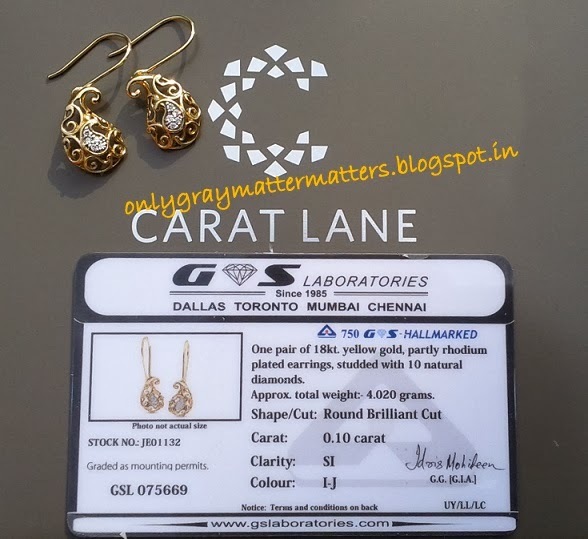 Today I am going to share with you my biggest online shopping experience so far: the review of Caratlane.com and my diamond earrings shopping from Caratlane. Caratlane.com is a renowned online Gold, Diamond and Gemstone Jewelry brand in India. Because the decision to buy Gold and Diamond jewelry online is not an easy one, this is a very detailed review to help you make an informed choice. I had known caratlane.com for 5-6 years and yet this was my first purchase with them. I had subscribed to their newsletter back in 2008. I think it was the first online gold /diamond jewelry store at that time. Every week, I used to watch the beautiful designs and wonder how genuine and safe this business would be until I gave up and unsubscribed. 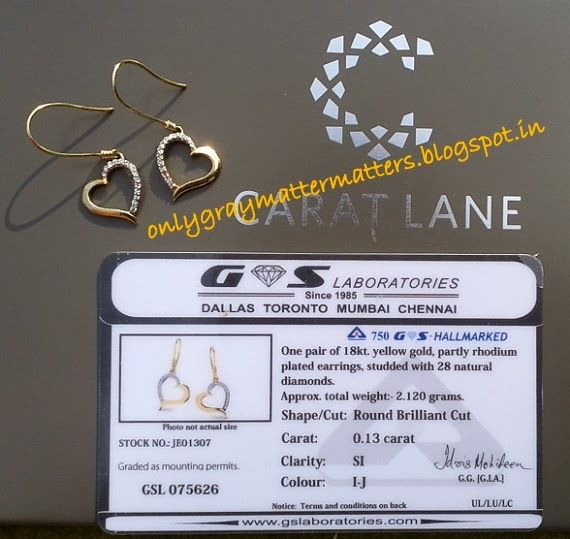 During this last GOSF/The Great Online Shopping Festival (Dec 11-Dec 13, 2013), I happened to see caratlane.com listed and just went to the site for some window shopping. My heart hooked on to two pieces of earrings. Since I had never bought from them before, I was indecisive whether I should buy or not. I added jewelry to my shopping cart 'n' times, removed 'n' times, then added again and kept playing like that for almost 2 days. In between I called up their toll free number (1800-102-0103) to clarify my doubts and to check delivery options in my area. The customer service representative patiently addressed all my concerns. I checked for reviews online and came across a negative review where the person mentioned his caratlane order was delivered to someone else and that it is not resolved even after 2 months. This scared me and I dropped the idea of shopping with them, since most businesses don't deliver on COD (cash on delivery) in my area and I didn't want to risk my money in a prepaid order. In the meantime, I received two follow up calls from the same customer service rep from Caratlane.com. I don't like sales calls, but this girl named Sadhna was convincing and persuasive without being pushy. She told me that it was the first time Caratlane.com was offering as high a discount as 20%. There was a flat 10% off on all diamond and gemstone jewelry plus additional 10% off on all purchases above INR 15,000. I was concerned that because they are offering a good discount, there might be some compromise on the gold quality or weight. 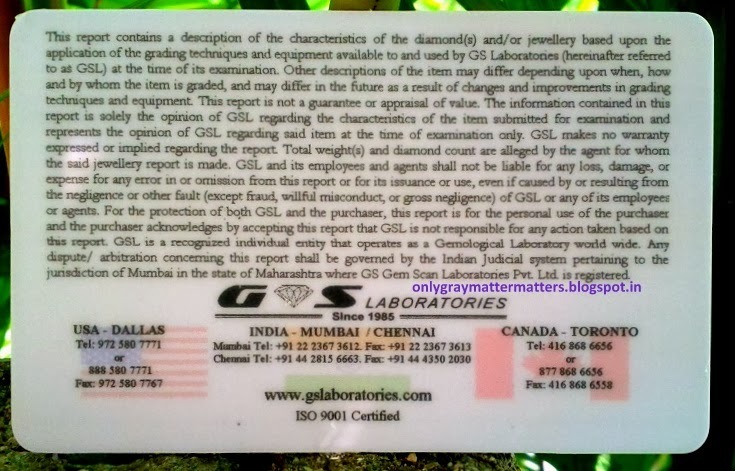 So I checked the website thoroughly and learnt that their Jewelry is certified by reputed labs and you get a certificate with it. All the details right from the length and weight of the jewelry item, quality and clarity of diamonds used was there. After satisfying myself on all aspects and checking with my mom, I finally ordered the 2 pairs I loved, just a few hours before the GOSF offer ended. Dec 13, 2013: Order placed. I received a confirmation email with the name of the representative to whom my order was assigned. The expected shipping date (Dec 24) was mentioned for each item in the order. So I knew I had to wait these many days. Dec 19, 2013: 6 days later I received an update that my order was on time and will be shipped on the scheduled date. Dec 24, 2013: Order shipped via Insured Speed Post and I received an email with the Tracking number. Dec 28, 2013: I was unable to track my order because Indian Speed Post didn't care to update the details. They were probably in the Christmas and New Year festive mood. I got worried and wrote to customer care. Received a reply the same day that my order has reached my local post office and got delivered the next day. Note: Caratlane has a tie up with Blue Dart and if this courier service doesn't operate in your area, your order will be sent through India Post as insured parcel. To know about insured parcels in detail, read here. They also have some ready to ship jewelry pieces and you can also opt for Try-at-home before purchasing. The Try-at-home option is available in the metro cities as well as many other cities and expanding further. This was my first gold purchase after a gap of 6.5 years and I was super excited to just rip apart the packing and look at my jewelry. But I took time to click pictures for record just in case anything wasn't right. So these pics weren't actually clicked for the review. As per the directions of Indian Post for insured parcels, the package was wrapped inside a cloth bag with wax seal. The box was made of thin tin and was badly deformed when I received it. Thankfully the contents inside were safe. This is how it looked. There were perfumed dry flowers, Jewelry boxes and an envelope containing credit card sized magnetic Jewelry certificates for each item. The packing was aesthetic. 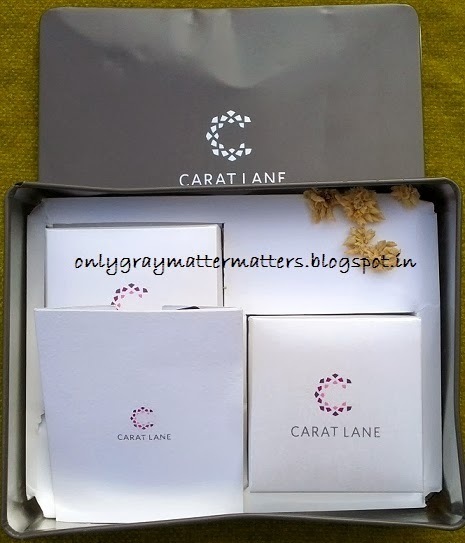 Did I like my Caratlane Jewelry? Left: Caratlane Yonder Heart Earrings. Check HERE. 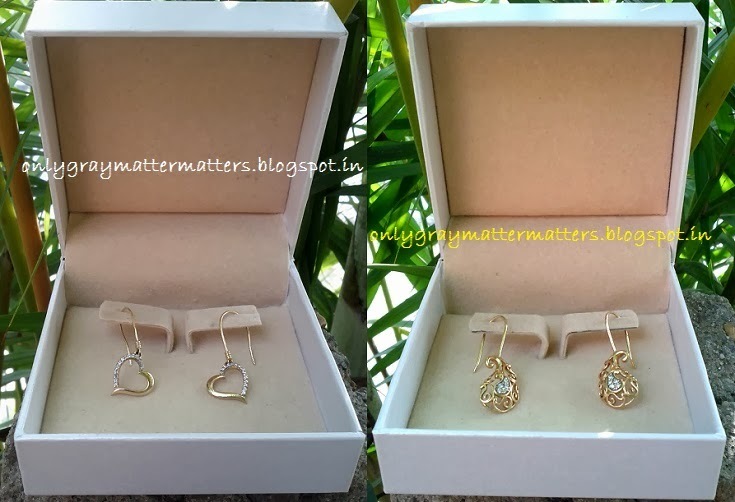 Right: Caratlane Ethea Paisley Earrings.Check HERE. Even though I had zoomed and carefully checked the model's picture for each pair of earrings, still these felt very very small and frivolous, especially the heart ones. See how pale the gold looks and the how unpolished and black the circle loops. The designs were very pretty but the gold looked very pale and brassy. The loop where the hook was attached looked black and dirty. I wore one pair for an hour to get the feel of it and then didn't feel like touching them for the next few days. My mood matched the cloudy gloomy rainy days outside. On Dec 30th, my son's birthday, I finally took out and wore the paisley one and started liking it gradually. The 18k gold looked a bit better in natural daylight. But apparently there were more surprises in store for me. 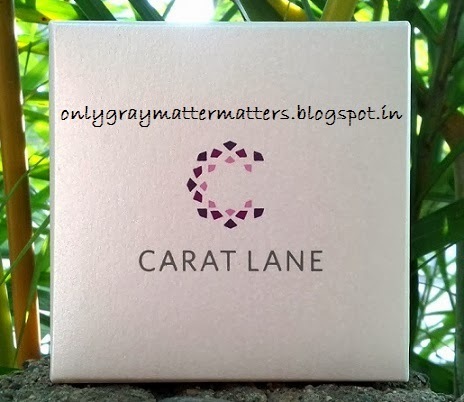 Caratlane jewelry caters to the taste of modern day buyer who attaches more value to aesthetics, wants hassle-free shopping and doesn't look at buying gold as an investment. So if you like modern eye-appealing jewelry and an extensive variety of designs to choose from, go for them. A very good price range starting from very low going up to your buying potential. There's something to suit every pocket. Suitable as precious gift items especially when you don't know anything about jewelry. Jewelry and diamonds are certified from reputed labs which gives you the confidence of buying an authentic product. Conflict free diamonds procured from ethical sources. Read more here. Insured Shipping and secure, hassle-free online shopping. Guidance and consultation available to extensively discuss before placing an order. Beautiful Kids Jewelry is also available. Strangely, you can't locate it on their site until you check their 'Gifts' section. Lifetime Exchange Policy. Read here. Why not to buy from Caratlane.com? If you think of gold as an investment and every penny matters to you, don't buy. This has more of aesthetic value than financial value. Some may call it 'fancy stuff'. Unlike the Gold Jewelry ordered at a local Gold shop, price of Caratlane Jewelry is not consistent with the daily market rate of gold. Jewelry prices are updated after a certain interval unknown to the customer. Every jewelry item just has a price tag. There is no breakup of charges as per Gold price, Diamond Price, Polish, Making Charges. Therefore No Transparency. The Jewelry also has a partial Rhodium coating which means you are paying for that in the Gold price. Weight of each Jewelry item is mentioned as Approximate. You can see the actual weight only in the certificate when you receive it. It may be somewhat higher or considerably lower than the weight mentioned on caratlane.com. Price of the same jewelry item on their partner site may be lower than when you buy directly from them. The beautiful small jewelry you see on their site is mainly made from readymade mounts/designs kept in bulk. No customization allowed even if you like something and want a slight change in it. 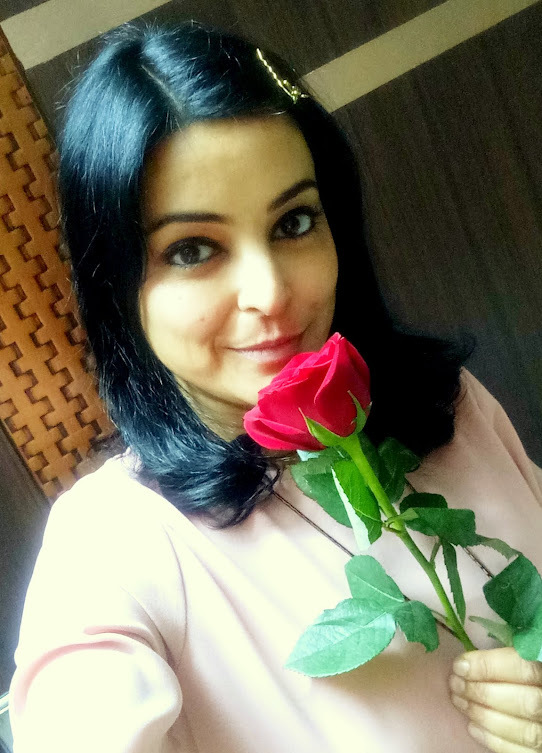 To continue with my shopping experience, I got a feedback call from Mr Ashish Kapoor, VP Sales Caratlane.com on Jan 6, 2014 and when I mentioned I am a blogger, I was asked to share my experience in a post to help future buyers. This was a very personal purchase and I didn't want to write about it, but this experience finally became just too important to share with you all. I soon discovered that my new diamond hook earrings silently slipped and fell off my one or the other ear every couple of hours. There was a serious flaw in the design as I don't let my hair loose and there was no friction with the clothing to cause the earring to fall off. There was no way to wear them for an entire day without losing it at least 4-5 times and then searching for it. So one day I called up Mr Ashish Kapoor to get some clarity on the return and exchange policies and informed him that I was really unhappy with my purchase. I always wanted the hook earrings to have a lock mechanism, which I have seen in custom made gold jewelry from local Goldsmiths. I trusted that a brand this big would take care of such things but except for the beautiful designs, their jewelry was poor in terms of functionality. This guy was really passionate about his brand and was willing to go any length to save his brand's image as well as win a happy customer. After defending their brand for quite some time, he agreed to get it fixed mentioning that I will have to pay for the customization. But when I mentioned it simply needs a change in the hook style and no extra gold really, he finally agreed to get it done without any extra cost. 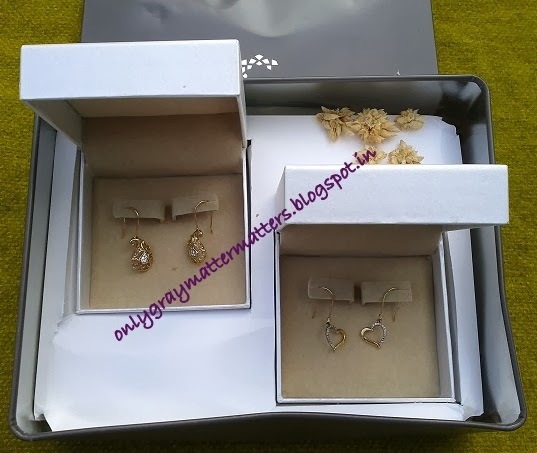 So my earrings finally got customized into lockable ones and I can wear them regularly now, but the brand image Ashish tried so hard to preserve got all torn by what all I had to go through during that customization period and the end product I received which was far less in weight than what is shown on their website. CLICK HERE to read the Part 2 of this Experience. Thanks for the review.The paisley earrings look pretty btw. In fact, both the earrings are super pretty after I have received them post-customization. Not sure why they were so whitish the first time. Either they forgot to do the Rhodium coating this time or they have changed the design part of the earring to bring down the weight. The main thing I am unhappy about is that they are much lighter than what I paid for. Thanks for reading Shilpa. Only the lady from the design team who was to take care of customization was a pain to get in touch with. Rest everybody right from the customer care to the Founder of Caratlane were prompt in responding and taking action. The overall experience with them was nice, except that like other customers, I am not blinded by the sweet treatment. They have cheated on the weight and I am going to prove that in detail in the next post. If they really want to follow the 'itne mein itnaaich milenga' principle, then they should not flaunt the fake discounts. waiting for the next part !! Nope, it's not sick, they are smart. They pamper you and blind you with that and you never suspect you are being befooled. Show people you are giving high discounts and then sell them Jewelry that doesn't really look like gold. Certifications and all can be manipulated when you are an online business dealing in Gold and Diamonds for so many years. Though the designs are pretty but reading your experience I would not go ahead and ever purchase gold items online.. Its sad to know that a big brand like caratlane doesnt even bother to do a quality check on their items..and I dont understand why the standard gold rates are not followed?? why should a customer pay a hefty amount for such a quality? The Jewelry is extremely pretty Jasmine, but it is not customizable. Hook earrings should come with a lock. Most people don't wear such stuff daily and keep it for special occasions, so it goes unnoticed with them and they are fine with it. And it's not about quality check. They deliberately made it poor the first time as they were giving a good discount, but actually wanted to make up for it at their own end by cheating on the gold weight. Hmm..that might be their trick...but till how long can they cheat people like this?..reducing the weight of an gold ornament in the name of customization is simply not acceptable..
Dear Supriya, there is a famous saying here in the north "A Goldsmith is not loyal even to his own mother" :D So whether it is online or a physical store, you never know what they are selling you even though I so agree on the tangibility / 'feel factor'. We had bought a hallmarked certified 18K gold diamond solitaire ring for my brother's engagement from a local goldsmith after checking, feeling it and satisfying ourselves, and today that looks like 14K, all white with just a hint of yellow. But at least you know what you paid for every gram of gold and you see it right in front of your eyes. Surviving as a leading online Gold and Diamond Jewelry store for so many years is not an easy thing, which gives them this trust and credibility over others. So I don't think anybody goes to the length of checking things in so much detail as I did. In fact, it took me also some time to discover the truth. My shopping experience with them was not at all bad, the communication was very smooth and they always got back. Only when I wanted the Jewelry to be customized as the functionality was poor, did I slowly went back to all the pictures I had taken and ultimately discovered that the weight was less than what was shown on the website. I would never dare to buy gold jewellery online due to trust factor. I like to see and check myself in person before getting jewellery. Looking forward to your next post dear! I haven't been able to post an update on this yet but caratlane did get back to me with all the answers and have taken care of all the negative feedback. Thanks so much for writting such a thoughtful review about Caratlane it definitely helped me a great deal. As I was also mesmerised by their flashy designs and was thinking to go for them. When it suddenly clicked me to check their reviews online and I came across your blog. It was an extreme eye opener. Thanks for writting all the pros and cons and providing such an honest review. Good Luck ! Dear Parul, I wanted to share that Caratlane happened to see this review a few weeks later and they got in touch with me. I was given some misleading information by this guy named Ashish Kapoor. So whatever points I have mentioned above, they gave me satisfactory replies to every single concern. They have even re-made the earrings and sent to me. Also, regarding the weight going down, they mentioned that they do make manual refund cheques whenever the weight comes out less as it is not humanely possible to make it in the exact weight given there, but they said during offer period, sometimes if gets missed out because it needs calculation to figure out the refund amount. But after this incident, they have made a software to automatically figure out such refund cases and issue a refund or voucher. I am just waiting for a few details from them and will post their replies in the 2nd part. Honestly, they took me by surprise when they actually came forward and addressed every single concern of mine. Their CEO is one of the humblest person I have ever come across. I am still 'mesmerized' with the designs, just like you and may purchase again from them whenever I have money. It has been 3 months I am interacting with them, bomarding them with every possible question and they have proved themselves trustworthy on every aspect. I was given a lot of wrong info by this man named Ashish and you can understand how one person can tarnish a brand's image. Please stay tuned and do read my second part on this and then decide if you would like to go with your purchase and my be you would. When you are going to publish second part....as I am planning to purchase jewelry from them....but not sure whether to proceed with the purchase or not. Hi Ravi, I have published the second part last night :) Kindly check the 'Home' tab above to see the article. Will just update the link under this article too. Thanks for the review. I was planning to go for bluestone online jewellery shopping. Do you have any idea about it? I too ordered a pair of gold earrings from caratlane it was pretty good. Then I ordered a silver ring from Gemln which as nice and fashionable. now i have also similar type of experience. after caratlane got money transferred for the diamond pendant they are are asking for photo identity proof .how on earth they can ensure my identity proof will not be misused. goog god now i have to get this thing checked also for the weight and diamonds. Dear Dr Sujeet, sorry I missed answering your comment. If you invested in a very high value diamond solitaire pendant there may be some legalities involved, where in they may have required to keep ur ID proof for their records. When I shopped with them, I have never been asked for an identity. Also, during my first shopping experience discussed above, I did happen to discuss about data security and the security of personal information of the clients with Mr Mithun Sacheti as I had some concerns and personally I have been through GLBA and Data Security Act trainings in my professional career. At that time he had mentioned that they were already working to get their employees trained on these data protection programs very soon, especially after the Ashish Kapoor mentioned above calling me up even after being fired from Caratlane. I am not sure if that training has been done, but I have never faced any compromise on my personal information after that and I have never ever been asked for an ID proof. So you can write directly to their owner if you found something fishy in your experience. i have few doubts now. 1. i have seen web site. its clearly mentioned the price of all (gold+diamond+vat+gem stones + making charges.) some one said they din mention . 2. is the quality also bad and not trust worthy ? 3.i actuall planned for 1.2 lak items for my wife. suggestions please. but wil go in person . not online shopping . is it still dangerous ? 1. 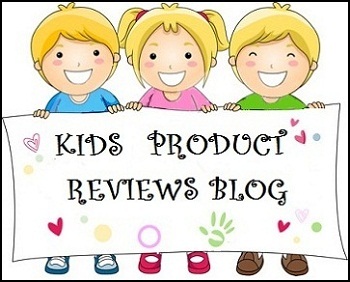 If you read the second part of this article, I have mentioned there that Caratlane started giving up price breakups for many items after reading my concerns shared in this review and my discussion with them as a customer. 2. The quality of jewelry is good. I have shopped with them 3 times so far for an order value up to Rs 35000. My Paisley Earrings have turned out awesome. But I didn't like another pair I recently bought from their ready to ship section. The weight of the product was not properly distributed. 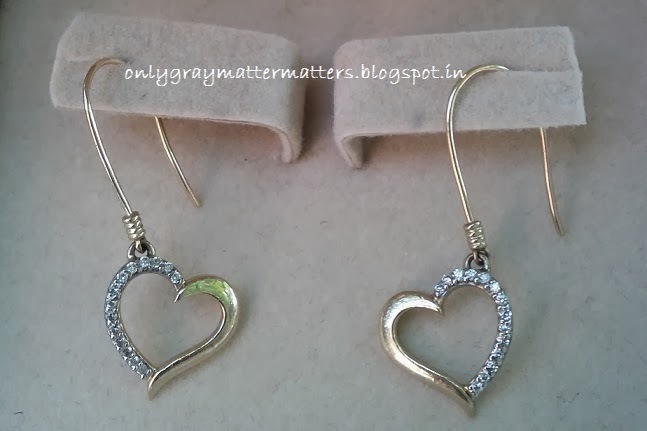 The earrings are very light and a lot of gold has been wasted on the screws at the back, which are very sturdy. I am sure this should not be the case with with value items. I think they also have personalized assistant and service available for high value orders. I read that somewhere on their site. Just call up their toll free number and tell them you want personal consultation and discussion before investing and they will get back to you and be with you at every step of the order. If you are in a big city, you can ask for a try-at-home experience and then decide to buy. Try at home is available in many cities. 3. The site is not dangerous to buy from. If you plan to invest such high value, let me assure you they will give you extremely well treatment, which they gave me even for regular value items. One important thing I got to know from my recent purchase was that the Hallmark certificate you get with Jewelry says the certificate does NOT authenticate the purity of gold and is simply to certify that the weight of the product is correct. This was a surprise to me as traditional jewelers never told me about this thing. The only thing that leaves me dissatisfied is that their jewelry is designed very delicate and somehow I don't feel safe wearing those items daily. Personally I want something solid that looks classy and can still be worn daily without worries. Hope this addresses your concerns. Hi lady, I enjoyed your review...it was quite neutral and well-written...even in terms of language :) I've been toying with the idea of buying diamond jewelry on caratlane and this review seems to be just what I was looking for. Thank you. Dear DJ, thanks for your comment. I have turned a full time businesswoman from past almost 1 year so not getting time to update the site or the reviews. Please do NOT buy from Caratlane. I made 2 more purchases after this incident and the final one was a diamond ring 'Band of Grace'. I had to return it twice to get it fixed as it was extremely pricky and cut into my skin wounding me several times. Still after 2 returns, the final product sent to me was defective and I had to return it for refund. I still get enticed by their designs, but out of my 4 purchases, only the Paisley earrings shown above is what I am wearing regularly from last 2 years. The other pair you see above and the diamond ring, both I have returned. Over 2 years, they have not been able to improve the experience or deliver a single perfect product. Many customers have shared their bad experience with me. So save yourself the unpleasant experience.